Millions of people each year visit the Mercedes-Benz Stadium in Atlanta, Georgia, home of the Atlanta Falcons football team. 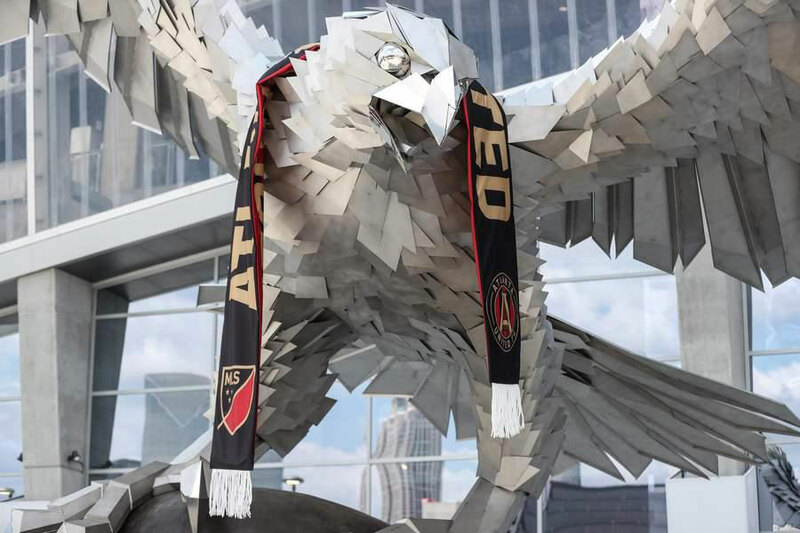 Since 2017, those football fans have been greeted by a 41.5 foot tall, 72 foot wide stainless steel falcon sculpture. The sculpture was designed and created by world-famous sculptor Gábor M. Szőke. Gábor has created many of monumental animal sculptures out of stainless steel and hardwood. His public artwork is exhibited in major cities around the globe. 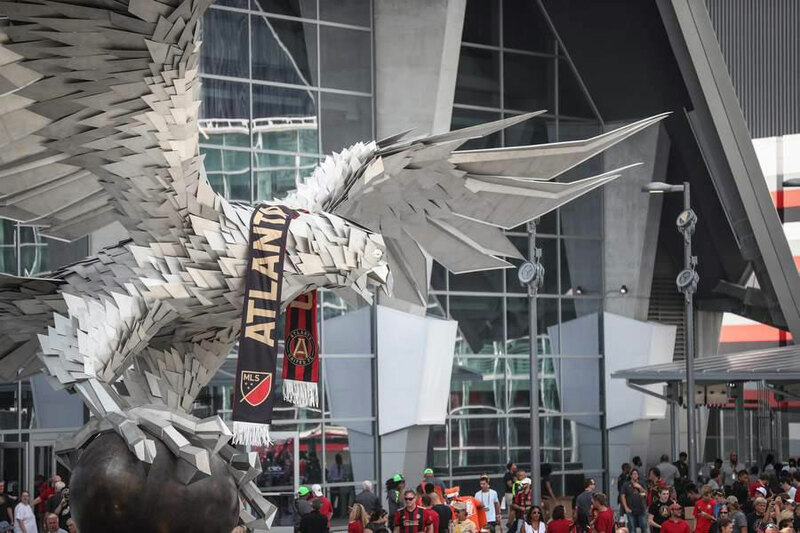 The Atlanta Falcon is the largest free-standing avian sculpture in the world. It entices Atlanta football fans, giving them a shared identity they can be proud of and enhancing the architectural value of the surrounding area. Fans take pictures of the huge statue and share them on social media with their friends. Because his sculptures are made with durable stainless steel and hardwood, Gábor’s public artworks are sure to be enjoyed for many years to come. Gábor M. Szőke is an internationally lauded sculptor and contemporary artist best known for his monumental, industrially wrought animal sculptures. Gábor’s aesthetic, expressed through the use of stainless steel and hardwood, enlivens his unique public art and informs architectural environments around the globe. Due to the magnitude of his installations, Gábor holds the record for the biggest equine statue in Europe and the largest avian sculpture in the world. Gábor has completed two commissions in the United States. He gained recognition for his first sculpture, the Flying Puli, which was installed in Smithsonian Park in Washington DC in 2013. His most momentous present-day work, Atlanta Falcon, designed for the new Mercedes-Benz Stadium in Atlanta, Georgia, surpasses his earlier record with a wingspan of 72 feet. The realization of this sculpture took 2 years to complete with the help of his team of 200 people. It was transported from his studio in Budapest in four 40-foot containers to Atlanta, where they worked on its installation for half a year. Its monumental proportions are characteristic of Gábor’s signature style. The sculpture has become an important landmark in Atlanta, where crowds gather under its wings to have their pictures taken. The sculpture is a defining feature of the city’s identity and has become an integral part of locals’ lives serving as a meeting point for old and young. In addition, the sculpture embodies the Atlanta Falcons’ slogan “Rise Up!”, which symbolizes the team’s struggle to become the very best in the NFL, as well as that of local churchgoers and Civil Rights activists. The Falcon is the largest free-standing avian sculpture in the world. 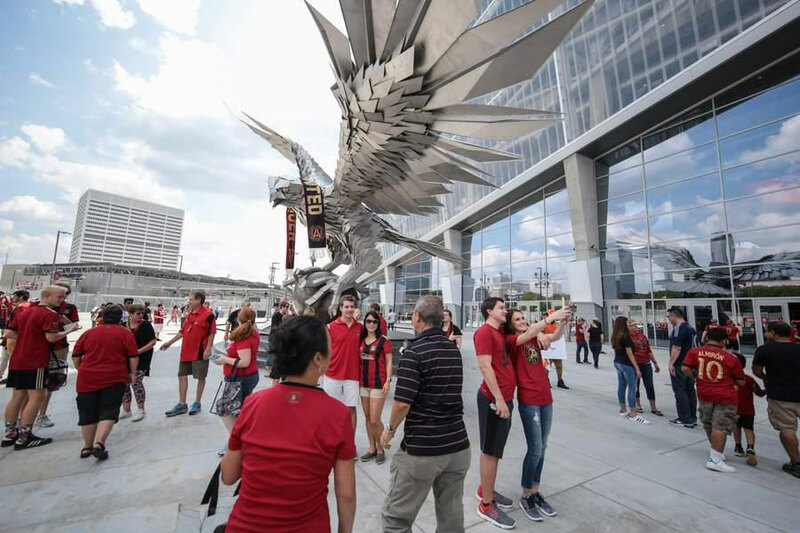 Fans outside Mercedes-Benz Stadium admire The Atlanta Falcon statue by Gábor M. Szőke. The Atlanta Falcon gives Atlanta Falcons football fans an identity they can all connect with.